It’s all too much like Zambia’s very own Game of Thrones. I’ve given up trying to keep up with who is suspending who, or who is supporting who, or who isn’t in the cartel, and who is, and other distracting issues. Though occasionally I get amused to see Miles Sampa’s political adverts on TV like he has already won the PF candidacy. But otherwise I’ve stopped trying to read the nonsense in the papers or the reports on ZNBC and yearn for someone in mainstream media to start asking the hard questions that we need answers to ahead of the 2015 by-elections. Side-bar, is MMD isn’t still a contender now that they’ve brought back RB? Is that even confirmed or it’s still wait and see? I have no issue against RB as a person, but there’s a lot of questions I’d ask about what it means to have him back in power – some I won’t ask on here right now. I’m not a politician, I’m not an economist, I’m really not any sort of analytical professional actually, but I am very passionate about Zambia. So I read with horror some of the ‘campaign’ promises of the presidential aspirants, reminding me of the PF 90 day promises, can we really be hoodwinked again? Both HH and Elias Chipimo Jnr have said they will lift the public servant wage freeze. More than 50% of our budget goes to salaries, in no way does this make sense, or can be sustainable. I can’t imagine spending that much of my operating budget (as a business) on wages. I’m not an expert but it doesn’t make sense to me, so how can it make sense to HH and Elias who have both run successful and profitable businesses. To life the wage freeze means that another area needs to pay for it – will that be health, education? We can slash the defense budget I suppose – since we’re such a peaceful nation. Education, as HH promises, will be free up to tertiary level, again, where is the money to pay for this? And why up to tertiary level? We need to invest more in our early grade years, where kids learn literacy, reading and numeracy – key skills needed for development and to compete. We need to train better teachers and focus our energies there. Reduce tax. As a tax payer nothing more would make me happy! As a concerned citizen, I question where government will get it’s income to pay for all the great free services and public servant wages if not through tax revenue. There is already so few people in the formal sector paying taxes to support the masses – but who would ever dare to suggest a way to tax the informal sector?! The voting populace. Can we have campaign promises that can actually be delivered on? Job creation needs to happen but can realistically only come from the private sector. Where is the campaign promises to help develop businesses more? And I’m not talking about reducing the cost of doing business here (thank you HH, that promise I’m all for, especially if it’ll help the indigenous Zambian and not just the foreign investors as it usually does), but about ensuring that business grow and become sustainable, and that we can encourage people to really be serious about agriculture and mining and help them do that. I’d restructure a whole section of ZDA to be consultants that work with business to build them up – can’t do all, but find promising ones and take them to scale. I’d make the Business Partners International model available to more people – on top of the financing they give you they add 30% more for you to get available training to build your capacity – they want to ensure they get their money back and that means not making your fail! While we’re at it, ensure that the public servants also have the capacity to do their job – efficiency across all levels. Maybe then they can justify their 50% of our budget (they can’t but at least if they were capable I’d feel more sympathy for them). Maybe we can have trade-offs. Create understanding that if we keep the wage freeze then we can have more drugs available in hospitals? More clean water in compounds. Whatever we could achieve by government being more fiscally responsible, otherwise won’t we just get into more debt? But none of this can be done overnight. Which brings me to my next question, why is the opposition even participating in the 2015 elections? Three years of the PF being in power, how many of the 90 day promises fell by the wayside? So what more an opposition government that has a year to show results before the next election? Aren’t they spending a lot of money campaigning right now? They should be focussed on 2016 – in my humble opinion – and leverage all their resources for that, because this by-election is considered a term is it not? So if they win, they’ll only have an opportunity to drive development for 6 years as opposed to 10. And now to address an even more sensitive issue that concerns me about our politicians. All the signs were there that MCS was not going to survive his term – sorry to say it, but it’s true, we all thought it but due to our strange relationship with death (if I suggest to a terminally ill person to have a will, I’m wishing them death… *rolls eyes*), no one said it. For this reason it probably was the right thing to do – keep publicly quiet about it – but behind closed doors you hadn’t thought through a campaign strategy in the off-chance this was going to happen? Or are they just messing with us? I’m very concerned about choosing a leader who can’t plan ahead. 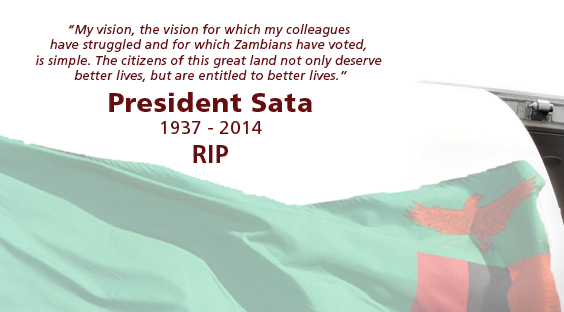 Zambia’s development challenges are not about today, they’re about where the country will be in 5 years, in 10 years. Where are the strategic plans that outline the vision for the future from each of these presidential aspirants? The time for pipe dreams should be over. But then again, the educated, or middle class, or intelligent ones (not necessarily one and the same person) are in the minority when it comes to the vote that decides the presidency. It shouldn’t stop us from helping our brothers and sisters to ask questions that will help them make the best decision for this country – because that’s what we need, the best decision for the country, not for the individual. Since working on our 64WD project, I’ve read up a lot about getting the country to independence and it struck me that those people, the first lot (before they got corrupted), did what they did for the people of Zambia, they understood the government worked for the people, not the other way round. Right now, we have a government that acts with impunity. People need to take their rights back and understand the power of their vote. I can’t vote in this by-election (thanks to the continuous by-elections that meant no new voters could be added to the electoral roll), but that won’t stop me for using my voice to participate in the election, by addressing issues that I care about, that I hope other Zambians will care about it.